Further afield from Darwin, there are emerald green places that provide excellent fishing, swimming and chances to explore what the Northern Territory is about, complete with brilliant sunsets, white sands, lush jungles and amazing assortment of unique wildlife to see. Along the Northern Territory Coast there are numerous places to visit with untouched scenery. This is true of the nearer surrounds of Darwin as well. Cobourg Peninsula with its Gurig Gunak Barlu National Park attracts visitors from all over the world as well as Australia, including cultural tourists, nature and wildlife lovers as well as those keen on fishing. 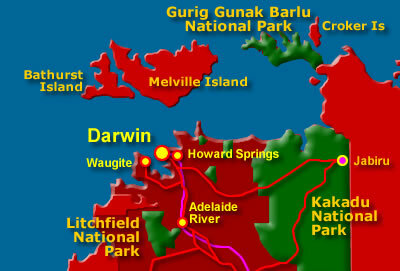 To the east of Darwin lies the Van Diemen Gulf with its flood plains. Although access is difficult, even impossible during parts of the Wet Season, those seeking great fishing and nature adventure keep coming back. Arnhem Land has Australian wildlife, a bewildering array of colourful birdlife, indigenous culture experiences, ancient rock art, fishing for Barramundi and exploring the bush guided by experienced aboriginal guides. Hopefully preserved for all time, closed Aboriginal protected regions like Arnhem Land have severely restricted access. It is possible to go on expedition, but one needs to obtain permits before venturing to places like this. With the proper permissions, you can even fly there from Darwin. Arnhem Land tours and safaris are best experienced with one of the few chosen operators that are allowed to operate here, the same goes for other Aboriginal protected lands. Yet you can venture on your own (April to September) with the right permits, staying overnight at secluded camping spots - but you will need good 4wd skills to be able to reach them. Tourist information and permits can be obtained from the Northern Land Council: Phone 1800 645 299. Those keen on fishing: Try a Marlin fishing cruise off the coast or venture futher inland on tidal estuaries for barramundi. Combined with the multitudes of wildlife, Arnhem Land is one of the last true frontiers on this planet. The Territory Wildlife Park, located at Berry Springs about 37kms south-east of Darwin, has on display hundreds of Australian native species of animals, all in the natural surrounds of the park. There is also the diverse flora, some of it unique to this part of the world. At the nearby Berry Springs Nature Reserve, you can find good swimming at one of the many freshwater pools in the park. Other places of interest and attractions to be found here include the George Brown Darwin Botanic Gardens, which features more than 1,500 native and tropical species, located just north of Darwin. At the Australian Aviation Centre, located at Winnellie, there is a growing variety of historic aircraft, including those used for war. There is even a massive B-52 bomber. At the East Point Military Museum, amongst other things, there are exhibits relating to the Japanese air attacks on Darwin. Hundreds of Australians died during these air raids. Litchfield National Park is one of the most stunning natural parks found in Australia. Within the park you can find deep waterholes for swimming, gorgeous waterfalls and long gorges. Camping in is available at Litchfield National Park Walker Creek, Wangi Falls, Buley Rockhole and Florence Falls, with 4WD camping areas at Tjaynera Falls (Sandy Creek). The Kakadu National Park has huge galleries of aboriginal rock art and natural wonders. Diverse landscapes of tidal flood plains to red stone escarpments, billabongs and long twisting rivers wind along the landscape. The wildlife and birdlife of the park are a big attraction to visitors, more than a third of all the bird species in Australia can be found here, with more than a hundred types of reptiles including crocodiles and over 1,700 species of plants. This park is one of the world’s largest. Some of the park becomes inaccessible during the wet season but after the rains, there are swamps and billabongs that attract numerous animals and birds, while the place blossoms. See about the current and daily weather in Darwin Australia and surrounds Darwin Weather. Still very much a frontier coastline, Darwin is still closer to Asian cities than it is to its national continent sister capital cities. Why not try a working holiday in Australia - Work in Australia. Darwin Australia has accommodation of all kinds, and due to Cyclone Tracy, there are no old hotels. Beside well appointed hotels, there are luxury resorts, motels, bed and breakfast, youth hostels and caravan (trailer) parks suitable for any budget. Well equipped 4WD vehicles, campervans and motorhomes are available for hire and a great way to see and explore the Northern Territory. Accommodation see - Hotels in Australia.